Sacroiliac dysfunction is a common cause of back pain, and may be associated with pirformis syndrome. The sacroiliac joint is located in the low back between the spine and hip joint, and normally does not move much. Misalignment of this joint can cause the pain associated with sacroiliac dysfunction. The typical patient is often a woman in her 30s or 40s who has had children. It is thought that the relaxation of the sacroiliac ligaments necessary for childbirth does not fully reverse, and that a subsequent minor trauma may sublux (partially dislocate) the joint and cause pain. 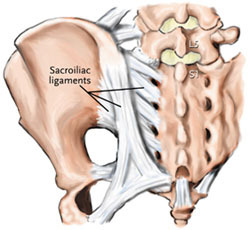 Younger women may develop sacroiliac problems as a result of sport or other injuries. The condition also occurs in men, but less frequently and usually from more severe injuries, often involving lifting while the trunk is in torsion. Sacroiliac dysfunction also may be associated with piriformis syndrome. The piriformis is a small muscle in the buttock that stabilizes the sacroiliac joint. When irritated, it causes pain in the buttock. The piriformis muscle happens to overlap the sciatic nerve and can also cause sciatic pain down the leg all the way to the foot. This is often mistaken for sciatica, caused by a pinched nerve root in the spine. What Are The Symptoms of Sacroiliac Dysfunction? Pain associated with sacroiliac dysfunction is usually located in the low back, just to the side of the midline, and may be felt on one or both sides. The pain often radiates down to the knee and into the groin. Another commonly-reported symptom is discomfort when lying down. How Is Sacroiliac Dysfunction Diagnosed? Accurately diagnosing sacroiliac joint dysfunction can be difficult, and must be done by clinical exam. During the exam, the doctor may try to determine if the sacroiliac joint is the cause of pain by moving the joint. If the movement recreates the patient’s pain, and no other cause of pain has been found (such as a disc herniation on an MRI scan), the sacroiliac joint may be the cause of the pain. A sacroiliac joint injection is another diagnostic tool that may be used. In this test, a physician uses fluoroscopic guidance (x-ray) and inserts a needle into the sacroiliac joint to inject lidocaine (a numbing solution). If the injection relieves the patient’s pain, it can be inferred that the sacroiliac joint is the source of the pain. A steroid solution also may be injected to decrease inflammation in the sacroiliac joint and decrease pain. How Is Sacroiliac Dysfunction Treated? Sacroiliac joint pain can become severe and disabling if not treated. If diagnosed early, the majority of patients with sacroiliac dysfunction and/or piriformis syndrome will improve with conservative treatment, which may include manipulation, physical therapy and anesthetic/steroid injections. More recently, BOTOX® injections have been used to relax the piriformis muscle. For those who do not respond to conservative measures, spine surgery is the appropriate next step, which involves stabilizing the sacroiliac joint through fixation and fusion. Sometimes the piriformis muscle also may need to be treated surgically to relieve pressure on the sciatic nerve.